Both teams are playing excellent hockey recently, but the Dallas Stars, to me, are the much better team. Even on the road taking on the Buffalo Sabres, I like the chances of a team with the type of depth and consistency that the Dallas Stars have. They can suffocate teams with their depth, and they can shock teams with a dynamic offense. Buffalo does not have the pieces to compete with them in either facet of the game. There may be an element of fatigue here because the Dallas Stars are traveling across the country to go all the way up to Buffalo. What’s more, the Sabres have gotten capable goaltending over their current hot streak and they have surprised us before. Still, the value here is undeniable. You have a team that will likely flounder somewhere near the bottom of the conference when all is said and done, taking on a team that is contending for a high playoff seed this season in the superior West. 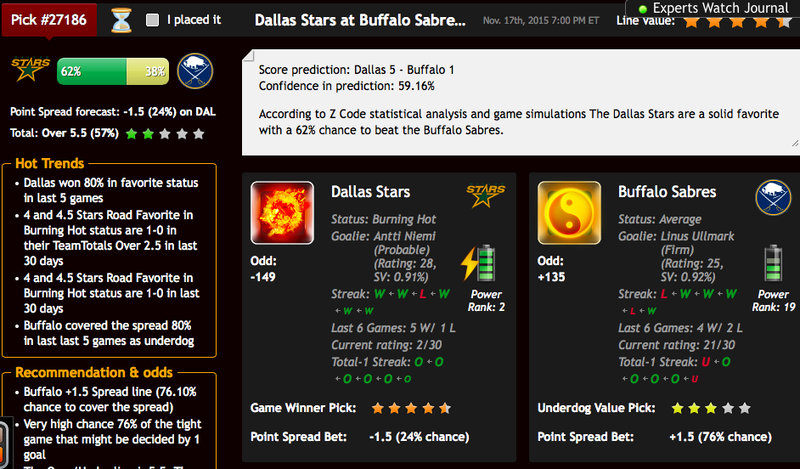 The computer agrees, giving 4.5 stars of value to the Dallas Stars on the road in this one with a 62% chance of victory. On a -150 line, I think that works. The signal is not necessarily exceptionally strong, but it is in agreement. All parameters look good for me here. I'm a Buffalo fan and I was very wary of the Dallas, they are a strong team with size, speed and grit. Happy to see my Buffalo climbing the ladder. Time to throw some money on the Stars.